I had first tried CodeCombat in its early days and it only caught my interest enough to keep it in bookmarks. While back I had checked it again, on a well timed whim. Discovered it to have just received major and interesting update. Stylistically CodeCombat is an RPG — with characters, equipment, and fantasy setting. The twist is — it is an RPG with programming code for an interface. The process is neither real–time or turn–based like games commonly are. You just work on your code and have it run against level until it can complete it. As you progress through level you earn the crystals (in–game currency) to spend it on equipment. Some equipment makes your character stronger in RPG sense, giving more hit points or speed. Other opens opportunities in programming sense, opening up new methods to use in your code. At first the game is movement focused. Later you have to learn (and code your character to) to observe and survive the environment. After a while you get to open several multiplayer levels. 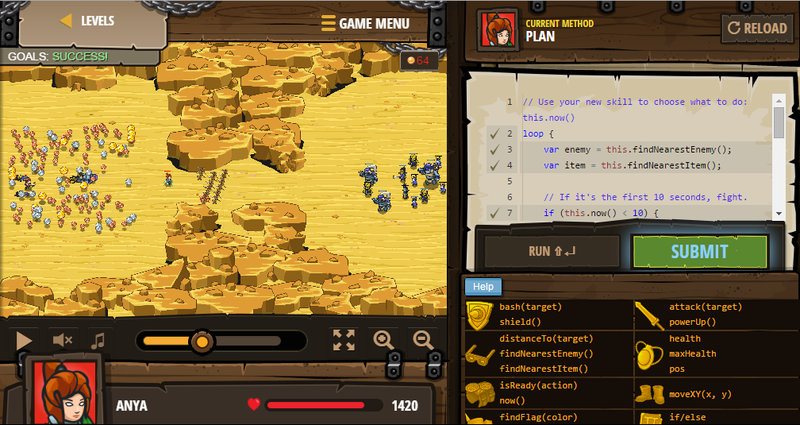 The gameplay is similar — you write code to achieve objectives. The difference is that when you finish and submit code it runs against code by other players. You do not observe matches directly. They are actually “simulated” by players contributing their local resources. But you see results of the matches and can train against players on demand. From how well you in simulated matches your ranking in multiplayer arena is calculated. The top of the rankings are pretty fiercely competitive. On one hand it pushes you to improve your code. On other hand there are considerable balance issues from players purchasing extra in–game currency with real money to max out equipment. As a programmer I had found the game to be very fun. There is no shortage of programming course online, with high degrees of interactivity. This one capture not just dull going through the motions, but the hectic process of creation and improvement of a program. Aside from balance issues mentioned above, the game is tad raw and about beta quality. There are outstanding bugs (protip — don’t buy expensive boots, you will have trouble walking :) and sometimes things plain break down. The total length of campaign available at the moment isn’t long. The levels are short, more so for people with programming experiences. The new levels are released weekly. Some of them require paid subscription. I am not sure it’s worth it monthly for current state of the game. I had paid for a month, then cancelled and will consider again few months later.